Our second day in Bhutan began with breakfast at the hotel and a drive up the mountainside near Thimphu. 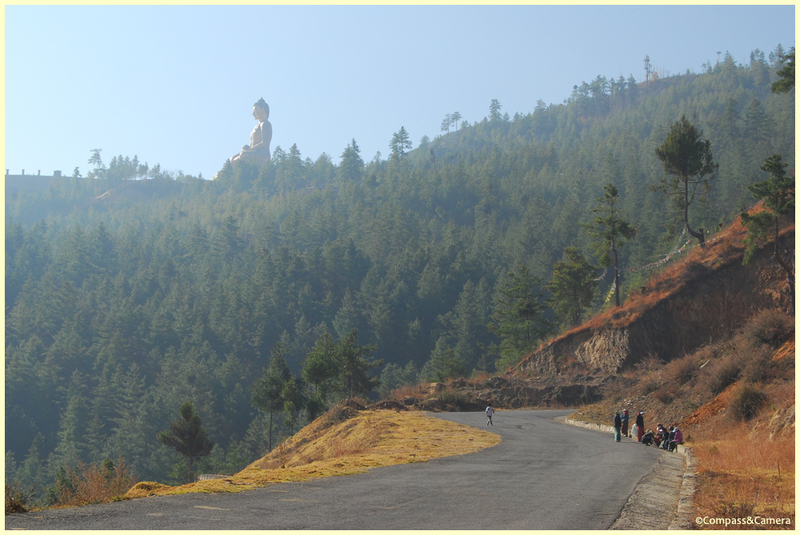 Fin was taking us to see Bhutan’s sitting Buddha — what will soon be the largest sitting Buddha in the world at nearly 170 feet tall. Bhutan is so small, and yet this Buddha is SO big — facing east, overlooking the valley and enormous in scale as you begin to approach it. The mountainside has been carved away and flattened out, with a massive expanse of concrete where the Buddha sits at the west side. The Buddha emanates good energy and happiness to everything in the vicinity. 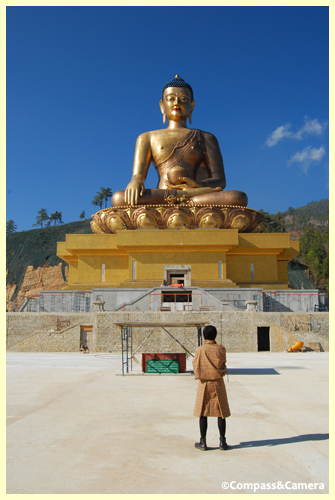 Construction of the sitting Buddha is an exercise in international cooperation — funded by a Singaporean, constructed by Indians, with metal work completed by Chinese and land supplied by Bhutan. The project was started about six years ago and is nearing completion, although quite a bit later than expected. 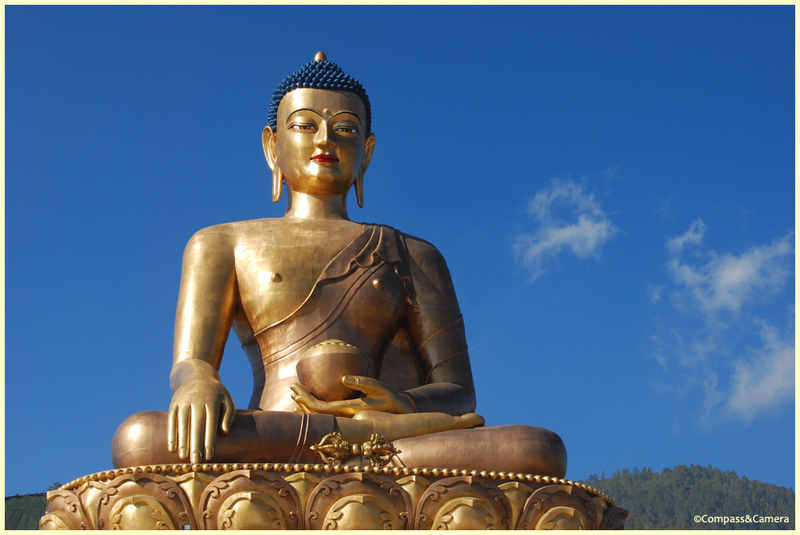 The Buddha was created in China and shipped in pieces to Bhutan, where it has been welded together on site. The cone-shaped third eye at the forehead is five feet across and encrusted with diamonds. The hair is deep sapphire blue, the face with well-defined features and a gaze that looks past you toward the edge of the mountain. 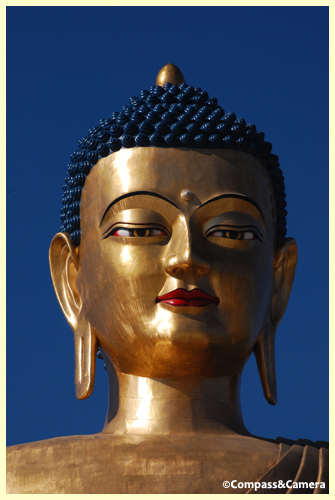 In the Bhutanese sun, the entire Buddha glows brightly against the sky. 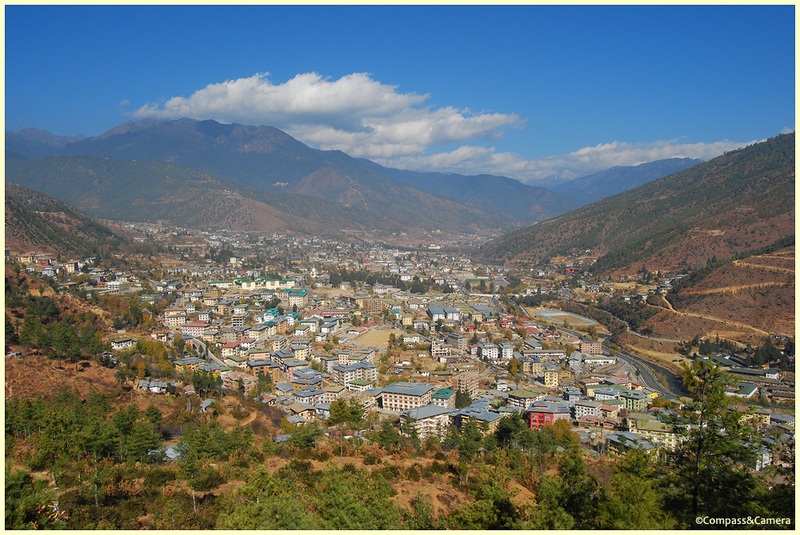 From the site of the sitting Buddha there’s a terrific view of Thimphu, the capital of Bhutan. From here, we headed across town to the hillside on the north side of the city for a morning hike at Sangaygang. 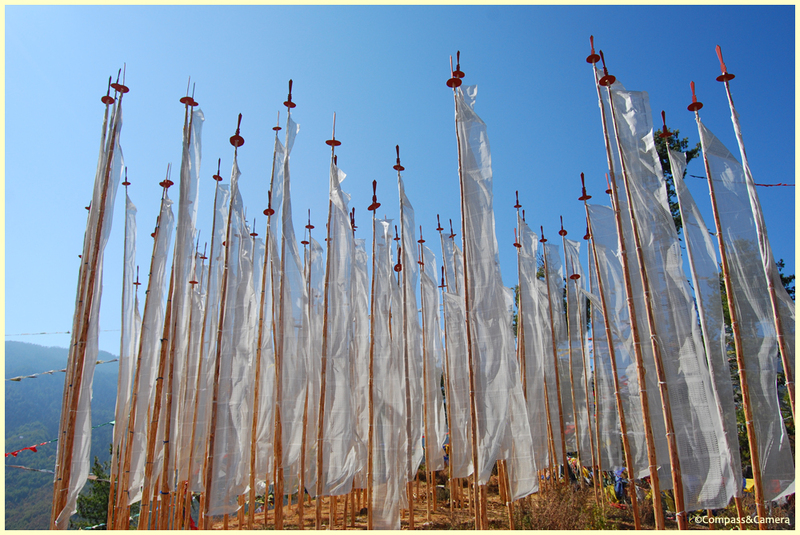 The hillside at Sangaygang has been joyfully overtaken with prayer flags strewn in every direction. 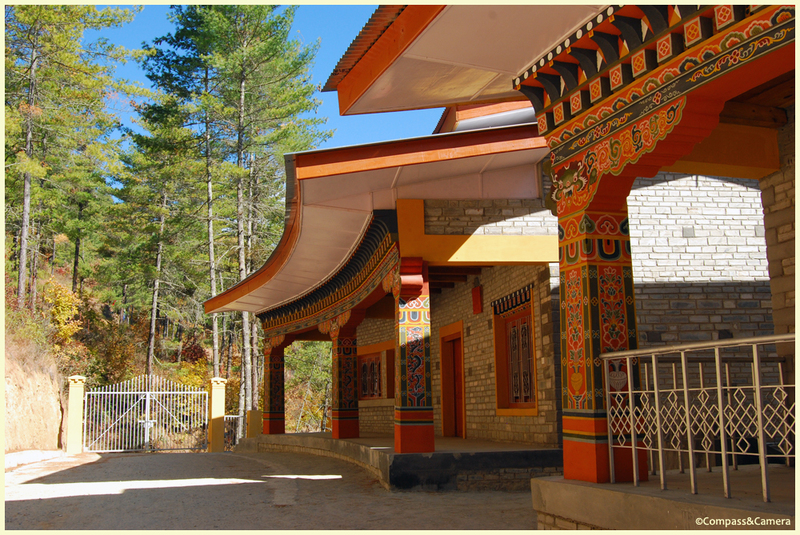 From here, the trail climbs steeply and leads to several monasteries and meditation sites in the hills. The current king’s residence, Samtenling Palace, isn’t far from here — we were able to get a glimpse through the trees. According to Fin, the fourth and former king (Jigme Singye Wangchuck or K4, as he’s known) is 57 years old and enjoys mountain biking on this trail. No wonder — it’s great single track with wide open views of the valley. Bhutan definitely has the terrain to become a world-class mountain biking destination of the future. At the top of the hill we reached Wangditse Goemba, founded around 1750. 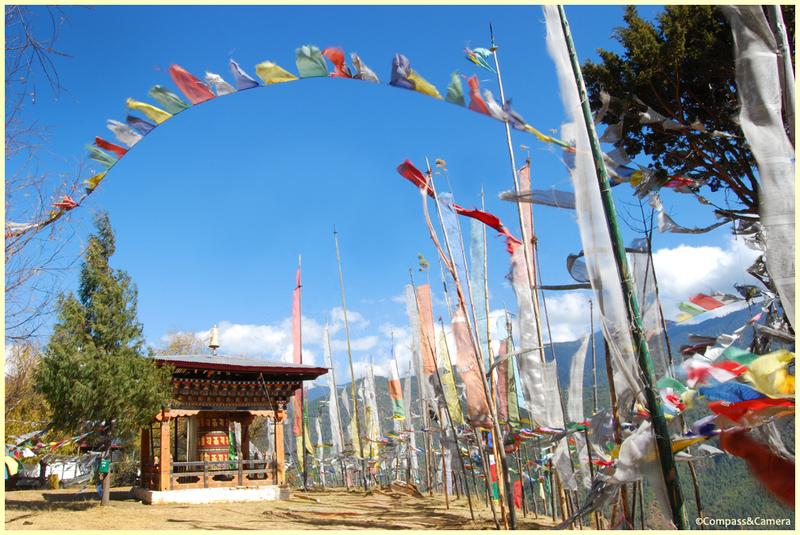 A large prayer wheel stands at the south side, with prayer flags staked along the edge of the site. All over Bhutan, groups of 108 tall white prayer flags mark significant locations and memorialize people who have passed away. In Mahayana Buddhism, 108 is an auspicious number referencing 108 volumes of the Kangyur — a collection of the words of the Buddha. 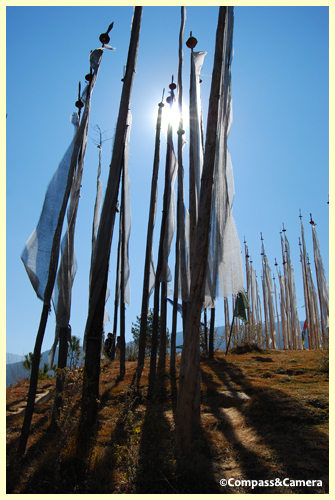 White prayer flags symbolize air, while blue, red, green and yellow symbolize space, fire, water and earth. 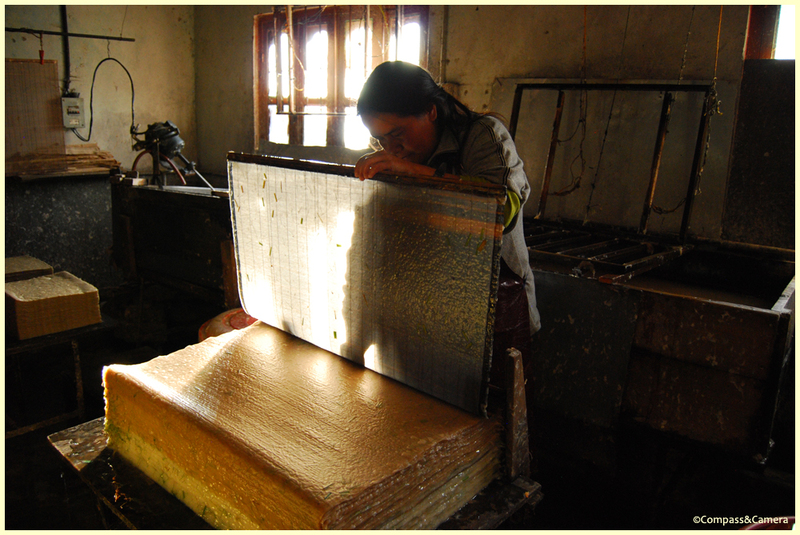 Traditionally, mantras were printed on prayer flags with wood blocks. 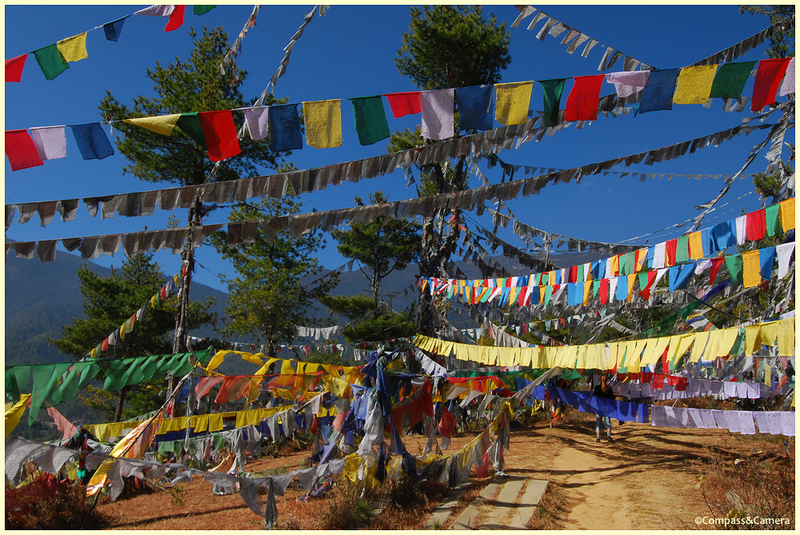 Wind spreads the peace, goodwill and blessings of prayer flags to everyone and everything around them. From Sangaygang, we drove down the hill and stopped to see Bhutan’s national animal — the takin. 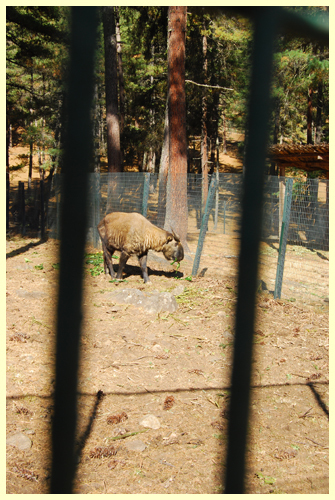 Thimphu has a takin preserve (free admission), with fenced acreage on which they can roam with barking deer. Takins are strange looking animals. Legend has it they were created when Bhutan’s Divine Madman put the head of a goat on the body of a cow and brought his new creation to life. A new building at the takin preserve will open someday as a museum and visitors center. It was amazing to see such beautiful new architecture, with ornamental spirit and exquisite hand-painted detail. 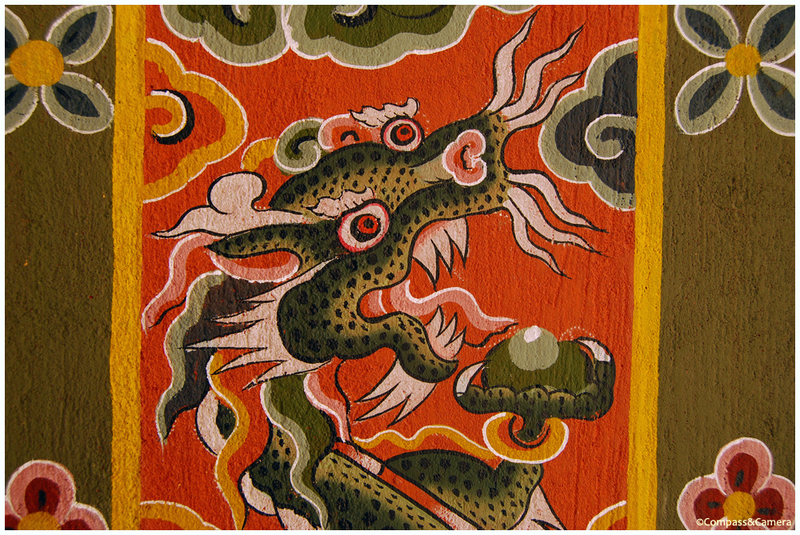 Traditional artistry is very clearly valued, preserved and passed on throughout Bhutan. 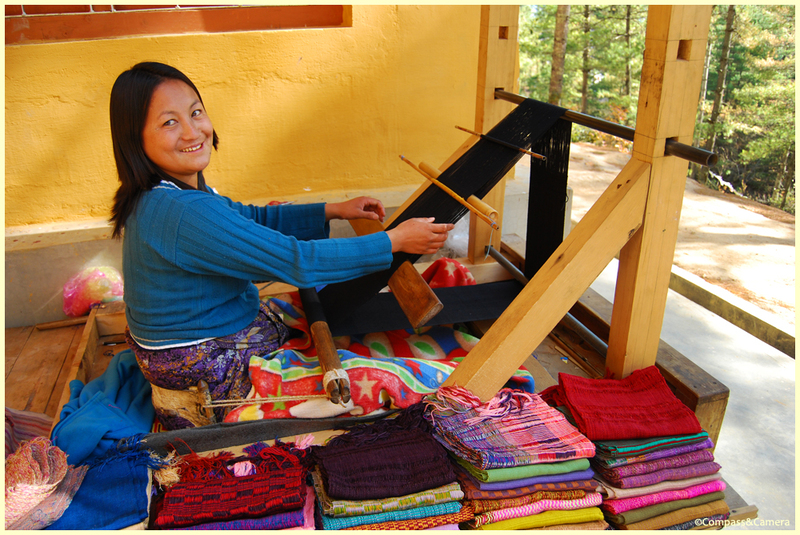 Departing the takin preserve, we stopped to watch this young woman weaving on a loom. She displayed stacks and stacks of colorful raw silk and cotton scarves she had created while overseeing the entrance to the preserve. I picked up a little souvenir for myself. Back on the road, we drove into downtown Thimphu for lunch, passing the Royal Thimphu Golf Club along the way. Quite a few golfers were out on the course enjoying the sunshine amidst a few deep water hazards. We ate lunch on the top floor of a building downtown — fried dumplings, buckwheat noodles, potatoes, vegetables and the usual Bhutanese chili-cheese combo. Fin, owner of Bridge to Bhutan who had accompanied us for our first 24 hours in Bhutan, introduced us to our official guide and driver who would take us from there. We were sad to see Fin go, but Kinga and Kumar were fun, well-educated companions from whom we would learn even more about life in Bhutan. After lunch, Kinga and Kumar escorted us to the bank and the post office — the latter being well worth a stop on anyone’s itinerary. Bhutan has a rich history of stamp production, with elaborate and beautiful stamps from the past several decades celebrating everything from Olympic sports to aviation to Bhutanese folk lore to butterflies of Bhutan. 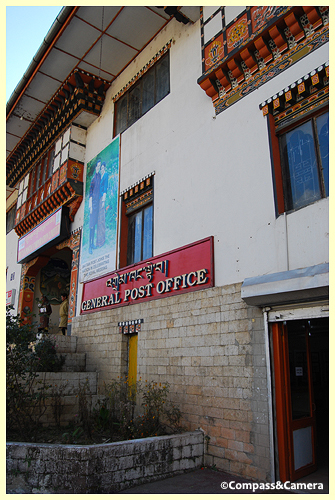 Best of all, you can have your photo taken and printed on Bhutanese stamps you can use on the post cards you send home! So cool! Check the mail, mom, but it might take a few weeks. 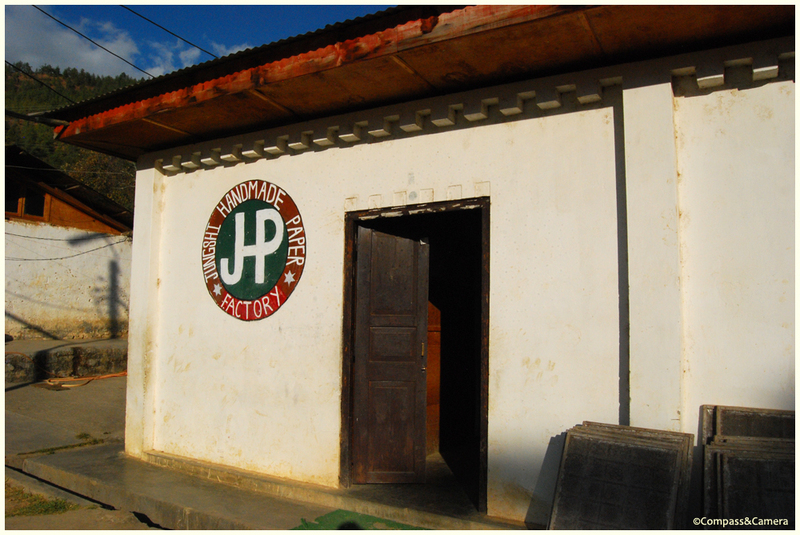 After the post office, we were off on an afternoon tour of Thimphu which started with the Jungshi Handmade Paper Factory. 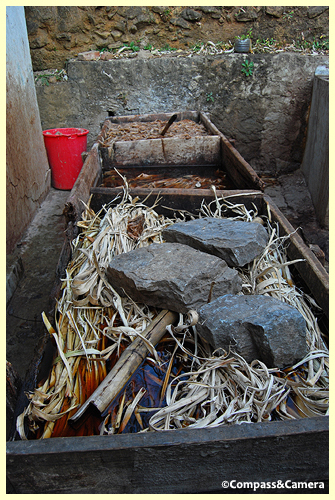 Housed in a one-story white building, the operation begins outside where fibers are soaked, boiled and cooled, then dumped in a heap on a table inside. 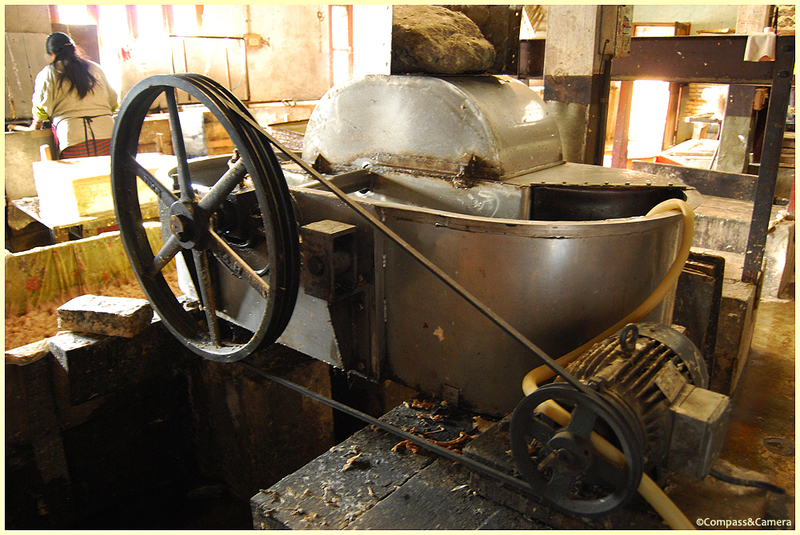 The fibers are processed into pulp using an old grinder. 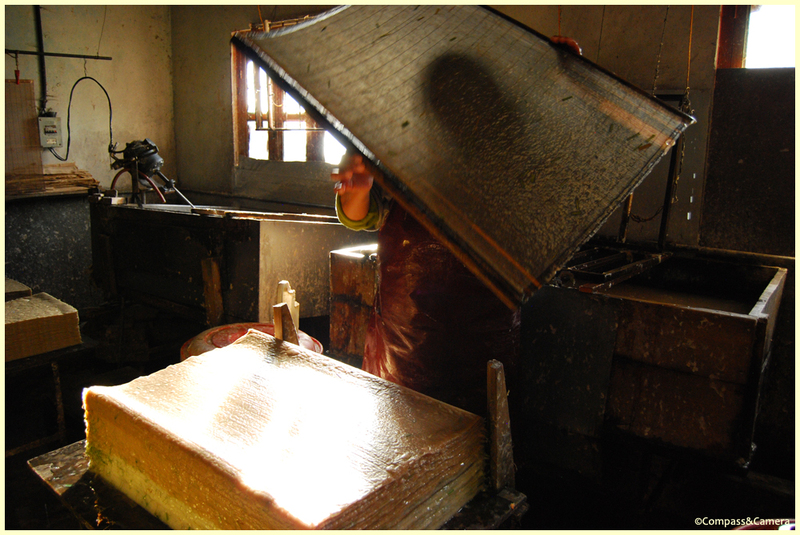 The pulp is poured into a sink where it’s spread onto a screen, then the screen is lifted out and the paper is placed in a stack where it releases water and dries into sheets. 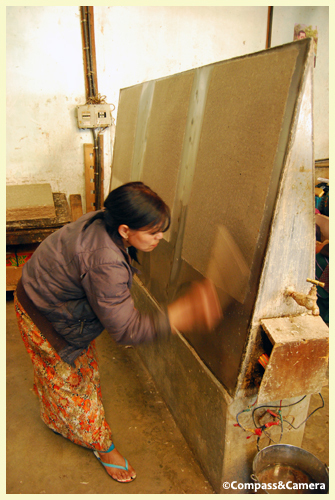 When dry, the paper is hung up one piece at a time, brushed off and stamped with a logo. 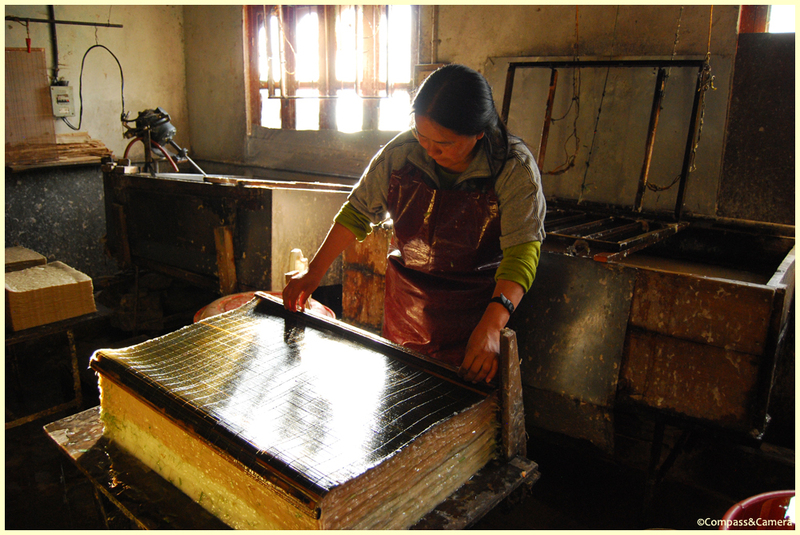 Jungshi has a small paper shop on site where you can buy the paper, posters and journals they produce. Leaving the paper factory, we made an impromptu stop at an archery range where an afternoon competition was taking place. In retrospect, the 20 minutes we spent here is one of my favorite memories from the entire trip. 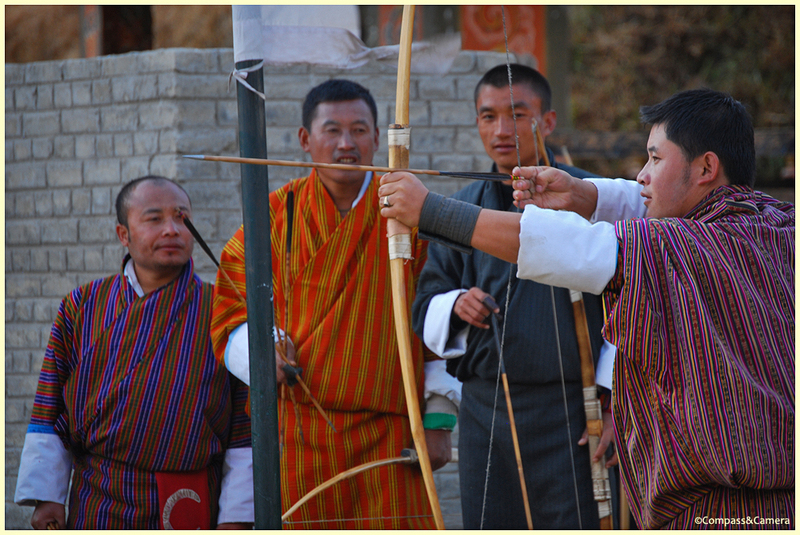 Archery is Bhutan’s national sport, practiced with great enthusiasm all over the country. About two dozen archers were at the north and south ends of the archery range which was 140 meters long. (What a VAST distance to cover with a traditional bow and arrow, not to mention the tiny target which is about the size of a dinner plate.) Archers at the south end of the range took turns shooting while archers at the north end stood behind concrete walls, out of danger, waiting to see if their arrows hit the target. When the archers at the south end had finished, the archers at the north end similarly took their shots. When we arrived, an archer at the south end had just hit the target near us which brought about a synchronized “dance” with singing and shouting by all the archers at the north end of the field. Quite a production, no doubt steeped in years and years of tradition. After the dance, the archers at the north end took turns shooting their arrows. Ready, aim, fire… then they each waited for shouts and hollers to see if they scored. 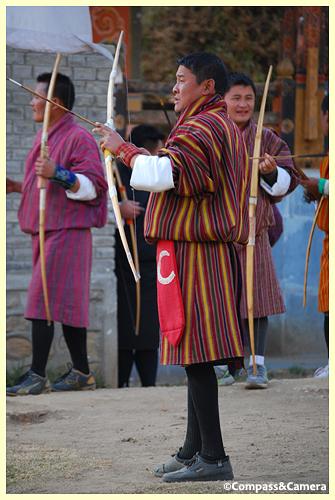 If I ever return to Bhutan, I hope to spend more time watching archery. It’s fun, spirited and pretty incredible to see these sharp shooters in action, even as an occasional dog wanders in front of the target. 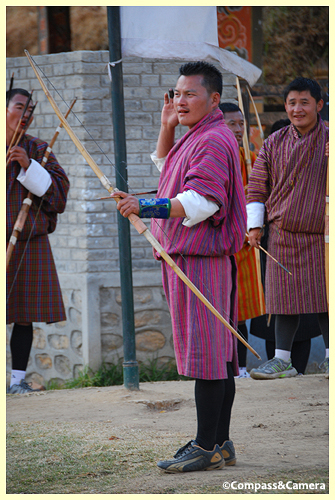 Just two Bhutanese athletes competed in the 2012 Olympic games — both female, and one of them in archery. It’s a sport loved by men and women alike. The sun was setting and that was our cue to get to the Trashi Chhoe Dzong for the changing of the guard — newly implemented since last year’s wedding of King and Queen Wangchuck. 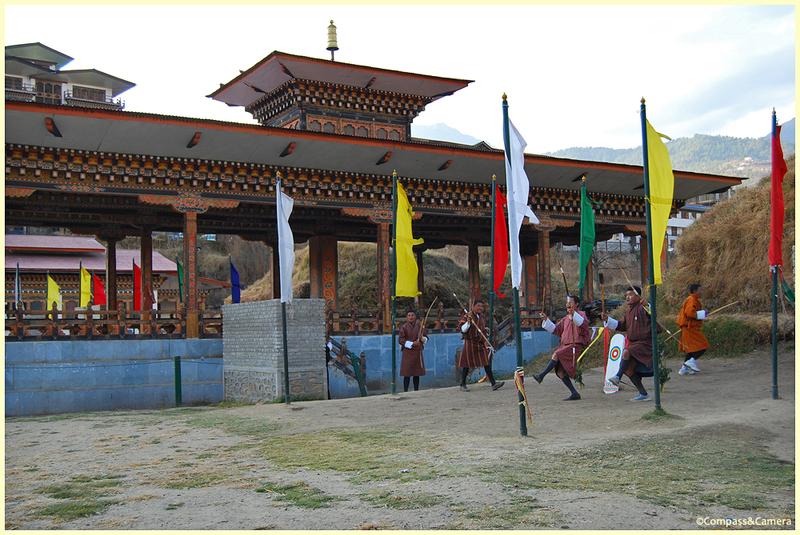 We walked to the far end of the dzong where soldiers were assembling to march out and lower Bhutan’s flag. In a ceremony that lasted about 15 minutes (I’m hoping to get video up soon! 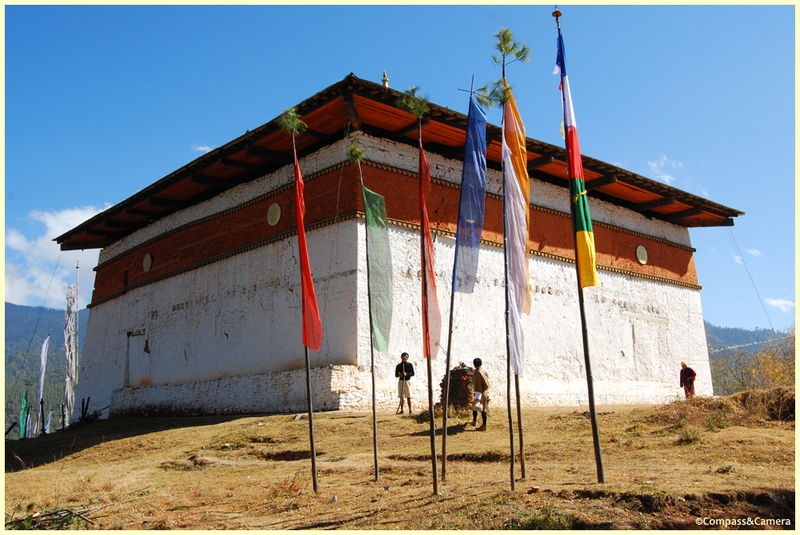 ), a monk led the procession from the dzong to the flag, then the flag was lowered, rolled, carried inside and stowed until the next morning. I reflected on the day’s events over dinner at the hotel. 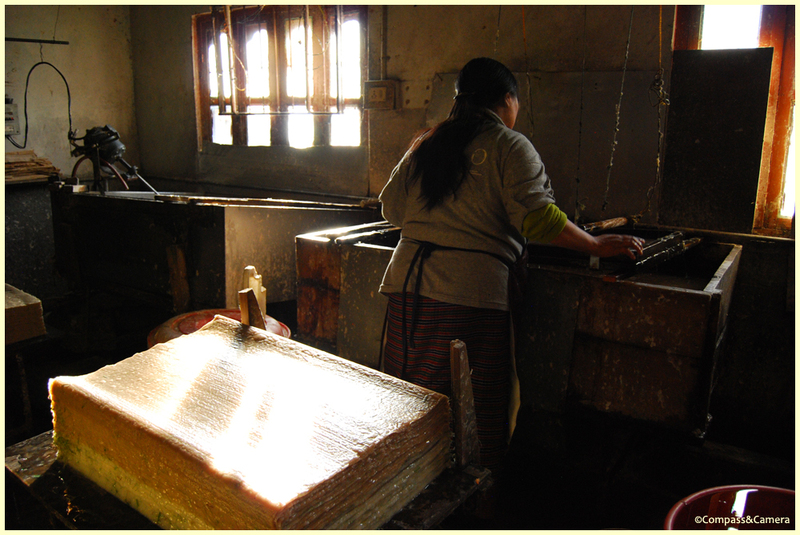 We had canvassed Thimphu from morning to dusk, capturing many moments of daily life in Bhutan that didn’t seem all that different from my own life: hiking, golf, archery, paper making, the post office and bank, a dzong, the takins and one big, giant Buddha (okay, that part was very different). It was all foreign, yet not unfamiliar. Fascinating, yet similar. Strangers, yet people who are just like me and you. It was a day of adventure for sure, yet just an ordinary day in the life of Bhutan. Great experience. Reminds me of Myanmar in a way. Very different geopolitics though. I hears Bhutan went strictly organic today. Enjoy. Thank you! Yes, we were in Myanmar in May and I would agree — similar but very different, too. Didn’t know about the organic development yet — thanks for the info, and for reading my post. K.
Always wanted to go to Bhutan! thanks for sharing this. Wow, thank you so much! I appreciate you stopping by and exploring! Much more to come – days three through six in Bhutan, and more from the Khumbu Valley. Thanks again! Thank you Lakshmi! Looking forward to India, perhaps sometime in the new year! Such lovely photos- I must go there! Thank you! Day Three is hopefully coming soon, amidst the holiday hubbub! More stories to tell and photos to share. Thank you for reading! I hope you have the chance to go someday. Congrats on being freshly pressed! Great post, as are all of your posts. Thanks for sharing these lovely photos and a detail of your trip. I enjoyed reading this very much. You’re welcome! I’m so glad you enjoyed it. Four more entries about Bhutan coming soon. Thank you for reading! Yes, it was amazing! I have four more days to write about, including Tiger’s Nest which was really beautiful. More posts are coming soon! I hope you’ll read. Thanks for stopping by. These are great photos. How do you get around word press’ limit on photographs? Thank you! Is there a limit? I guess I’ve been ignoring it! Maybe that’s how? Thanks for reading! Thank you for reading and reblogging, Sharon! Happy holidays! I really want to experience it! Thank you Jenny! I hope you get there someday. Pingback: Day Two in Bhutan: This is Life « Resort & Luxury Real Estate, Co.
Reblogged this on Resort & Luxury Real Estate, Co..
Really awesome experience! I was wondering if people need to line up in order to get visa to enter the country? I think they have tourists limitation? Thank you! Your visa is arranged before you arrive, by the tour company with whom you book your trip. You receive a visa number/form by e-mail. When you arrive at the airport, immigration handles it from there. Pretty easy and organized. Thanks for reading! Thanks for answering my question! It helps a lot! Happy Holidays 🙂 Hope you are having fun with your family and friends! Thank you! Great to hear you enjoyed the photos. More to come soon of days three to six. This is fantastic.Love both photos and information. Thank you! I look forward to checking out your blog! Very nicely done. Makes me want to go, even more than I did before. Thank you very much. More to come soon – days three to six. I hope you go someday! Thank you for reading my blog. Happy holidays! Great collection of photos there, and also a good commentary. A good read and the photos are just right. Informative!!! So much fun reading your blog. I was overwhelmed by soooo much information! Thank you! Yes, we really packed a lot into one day – it was exhausting. Thanks for reading! Days three to six coming soon! I’ve seen pictures and read stories of Bhutan. But every new perspective of the country is always interesting. Reading yours makes me dream of visiting the country one day! Thank you! I hope you get the chance to go someday! These are amazing pictures, of what looks like an amazing place! I want to go there! Last summer we went to Hong Kong and spent the day on Lantau Island that has a huge bronze sitting Buddha similar to this. It’s on top of a mountain like this too. Very cool blog! Congrats on being FP’d!! Thank you SO much! I am just overwhelmed with the wonderful support and enthusiasm of my fellow bloggers like you. Thank you for reading and commenting. I hope you get the chance to go to Bhutan. I haven’t seen the sitting Buddha in Hong Kong – thanks for the tip! I’ll try to go. Yes, more on that in my next entries, days three to six. There are many things to be happy about in Bhutan. Thanks for reading! Thank you! I hope you make the time to go soon – it’s changing very quickly according to many locals. Thanks again! Wow, I´d like to go there!! Go! It’s great. Thank you for reading! Thank you! As I departed for Bhutan I had a moment when I thought about how much my mind was going to be changed in the next six days – that I would return with new thoughts and perspectives, which definitely happened. I love that about traveling – you do not return as the same person. Or if you do, you may not have traveled far enough. Thanks for reading my blog! It wonderful with pictures ! This is amazing! I hope the rest of your journey turns out to be equally inspiring! Beautiful pictures too! Thank you! The rest of the journey was great – days three to six are coming soon! Hope you’ll read along. 🙂 Thanks for stopping by! Bhutan is one the most peaceful places I have been to. The most beautiful place indeed. Clean roads, clean air. And the joy on the peoples faces is unmatched anywhere else in the world. Agreed, quiet and peaceful. Looking forward to writing about our Day Four walk in Pobjikha Valley to see the black necked cranes. It was near silent, just the wind blowing and birds flying. Thanks for reading! More to come soon! I haven’t been to Tibet, but can’t wait to go. Thanks for reading! I have been to Bhutan and want to go back there someday. It’s the most beautiful, peaceful and safe country that I have ever seen. your post and pictures are very informative. enjoyed reading. Thanks Amrita! So few people have been there! Great to hear you had a chance to go. I agree – such a beautiful, peaceful country. Thanks for reading – more posts coming soon! Wonderful photos! I’m really curious now what Bhutan will be like up close. Thanks for sharing. Thank you for reading! Days three to six are coming soon, when I have the chance to write amidst all the holiday fun! Thank you! Yes, I really enjoyed the trip. More to come soon! Enjoyed reading every bit of your post! & the photographs you take are simply amazing 🙂 makes me want to visit Bhutan one day! Ah, great that you lived abroad in Asia for a year! What an experience, I’m sure. Where did you live? Thanks for reading! I was an exchange student at the Polytechnic University in Hong Kong. Quite a life-changing experience I must say! Asia is full of so many vibrant and enchanting countries – definitely can’t wait till I can go back! Do you live in Asia currently? Yes, there is much culture and beauty to experience. Thanks for reading! Yes, peaceful indeed. And so quiet in the countryside. Thanks for reading! Days three to six coming soon. Thanks for an amazing journey. Have added Bhutan on the wish-list! Thank you for reading! Bhutan is worthy of wish-list status. Hope you get there someday! Hello! Greetings from the US (currently). Thanks for reading! Fascinating has to be the right word! Wonderful to be able to travel this beautiful country with you. I need to return to the start of the adventure now. Thank you! Days three to six are coming soon! Hope you’ll continue to read along! Lovely photos! I’d like to be able to visit one day. Thank you for being so descriptive! I plan to get to Bhutan someday but this really helps until then! You’re welcome! There is less info out there about Bhutan than other, more traveled countries. 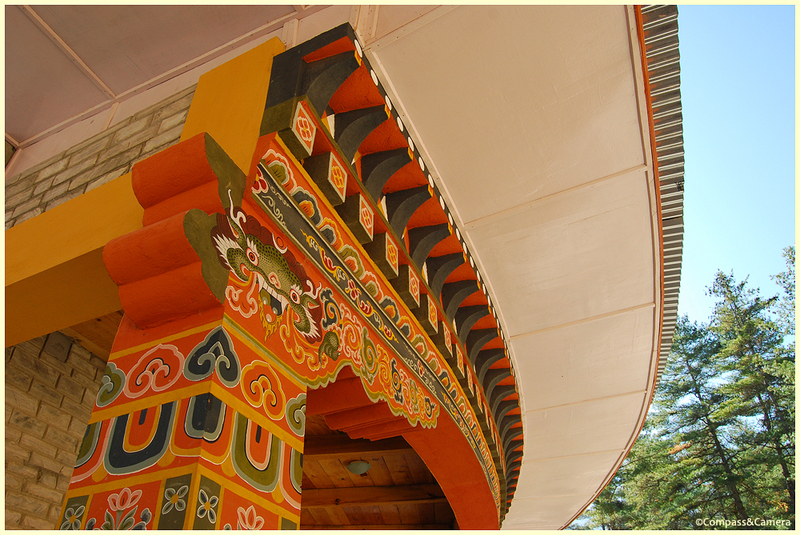 I was hoping to shed some light on what to see and what life is like in Bhutan. Days three to six are coming soon – hope you’ll read long. Thanks! Wondrous images – thanks for sharing! According to some global survey Bhutan is the happiest country in Asia. I can feel that from ur pictures. Amazing pictures. Yes, people seem very happy in Bhutan. It’s so quiet and peaceful, too. Yes, we went to Tiger’s Nest (Taktsang) on the last day. It was spectacular. I’ll be posting days three to six soon, with lots more photos. Hope you’ll read along! Thanks! I am waiting for your posts. I am following your blog now. I feel like I am right there with you. Beautiful! Perfect – that’s the effect I try to create! Thank you for reading. More to come soon! Nicely written and nice capture too. Have u been to my country Indonesia? I would like to read ur experiences here. Thank you! Yes, I’ve been to Indonesia – Bali, Lombok, Batam, Sulawesi… all wonderful places in a great country! Just search for Bali and Sulawesi on my blog and the entries should be there. Thanks for reading! Awesome! Thanks for reading. I just posted Day Three. Happy New Year! Great pics. By the way, did you hang your own prayers flag there? Ah, such a good question and I’m sad to say I did not. However, with the help of a monk I did pick a name for a child at Tiger’s Nest. More on that coming soon! Thanks for reading! Great post, great story and a great culture! Thanks for sharing such a beautiful experience. I couldn’t agree more with your comment about our beautiful world. It’s such fun to share it with others, especially places that not many people have been to or plan to go. Thanks for reading and Happy New Year! Love this! Especially the prayer flag photo. Thank you so much for sharing these photos, it’s definitely stirred the travel bug within me! Aha! Mission accomplished to stir the travel bug within! I just posted Day Three. Enjoy, and Happy New Year! Thanks for reading. Wow, awesome shots. Looks like you had quite the experience there. I’m thinking of visiting this summer, and your pictures make me want to go even more! Thank you! I hope you go! It’s a special place. Happy New Year! Keep trying! Hope you get there! Thanks for reading! Great post with photography about Bhutan a country that measures it’s success by the level of happiness of its inhabitants. Brilliant post! Your pictures are beautiful. I spent two weeks in Nepal in October and had an amazing time there. Bhutan sounds wonderful too. I’ve added it to my list of places to see. Thanks so much! I just posted Day Three – hope you enjoy. Nepal is such a great place. Great to hear you enjoyed it. Thanks for reading and Happy New Year! Wow! These are amazing photos. Looks like you had an amazing time 🙂 Love the stamp idea! I’m off to South East Asia soon and am inspired! Thank you! Have fun in SE Asia! So much to explore – endless! Thanks for reading and Happy New Year! What a fantastic trip, and such beautiful photographs. I look forward to hearing more about your adventures. Thank you! I just posted Day Three. Enjoy, and Happy New Year! These are some awesome photos! 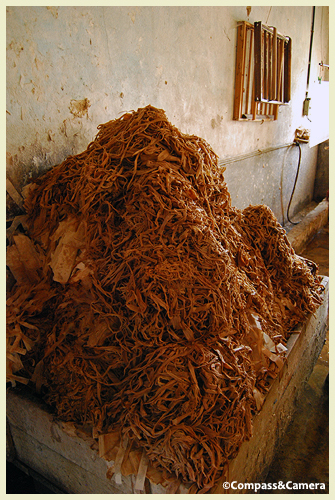 I especially loved the story and pics about the paper factory. Very interesting. Thank you for sharing these and have a Happy New Year! Thank you for reading! Happy New Year! Amazing article and the beautiful pics validate your experiences. Wonderful post, Kelly, and fabulous photos too. I’d love you to join in the weekly travel themes on http://wheresmybackpack.com sometime. Happy travels! Thank you! Thanks for the invitation to join the weekly travel themes. I’d love to! I’ll check it out. Happy New Year! Thank you, Bryan! 🙂 Day three will be posted later today. Happy New Year! Thanks Felicity! Happy New Year! Love your blog! My wife and I were in Bhutan in October and loved the experience much as you describe it. No wonder that Michael J Fox goes there and his shaking from Parkinsons stops! A magic place that we will definitely return to. Thanks again. Thanks John! Wonderful to hear you enjoyed Bhutan as well – it IS magical. I didn’t know that about MJF! Day three will be posted later today. Thanks so much for reading my blog. Happy New Year! It sounds like our guide was just like yours – his name was Tendin and he worked for Yangphil. 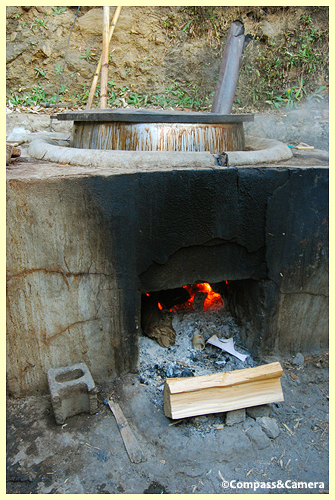 Have you seen the Wickipedia entry on Bhutan? It is horrible and needs someone with your skills to get it fixed. I tried but failed – it has statements like Gross National Happiness is a ploy of the government to subjugate minorities. Can’t wait to read the rest of your trip. Happy New Year! Thanks John! Awesome that you’ve been to Bhutan! My adventures of day three will be up within the hour. Haven’t read the Wikipedia page – too bad about the false info. Hope you have a happy new year, too! Thanks again! Beautiful pictures and beautiful country !! Yes! Thanks for reading, and Happy New Year! Yes! He’s wonderful! I can’t say enough great things about him. Thanks for reading. Happy New Year! Great stuff you have here. I’m happy to stumble into it. Thanks you Lex! Great to hear that! Day three in Bhutan will be posted later today. Happy New Year! great post. I love to travel and I also have my camera with me 🙂 keep writing and visit my blog sometimes! Thanks for reading! I’ll visit your blog – what’s the name and URL? Great post. Bhutan is a fantastic country. I had the good fortune to visit it a couple of years ago. The archery is not to be missed especially the dancing and singing after someone makes a good shot. When we were there they were also singing, dancing and shouting to put the opposite team off! To me it wasn’t only a sport, which is taken very seriously, but also a great social occassion. I look forward to more posts about your trip. Thank you! I couldn’t agree more! 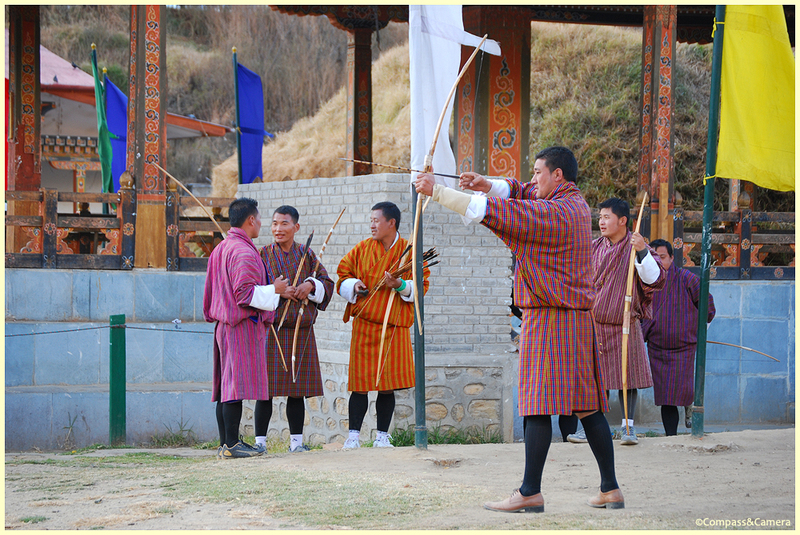 Bhutan is great and the archery was such an unexpected highlight. I would love to go back and see more. Thanks for reading! Day three will be up later today. Happy New Year! This submit truly made my day. You cann’t consider just how much time I had spent for this information! Thank you! Awesome! Thanks for reading and Happy New Year! I love the photos and write up of the giant Buddha. How amazing to see it in person. Congratulations on creating this experience for yourself. Happy 2013. Thank you! That’s very insightful what you say – “creating this experience for yourself”. That’s really the key – we can all create the life experience we want to have. Thanks for reading, and Happy New Year to you, too! Thank you! Christmas came early this year with FP! Thanks for reading. It’s important to travel east. I must apologise for my formatting advance. Something went amiss and I seem unable to change it. Just great! Thanks for sharing your great experience in Bhutan. It is one of the countries I want to visit the most. So much curious about their daily life and culture! Thank you! I hope you get the chance to go there someday! 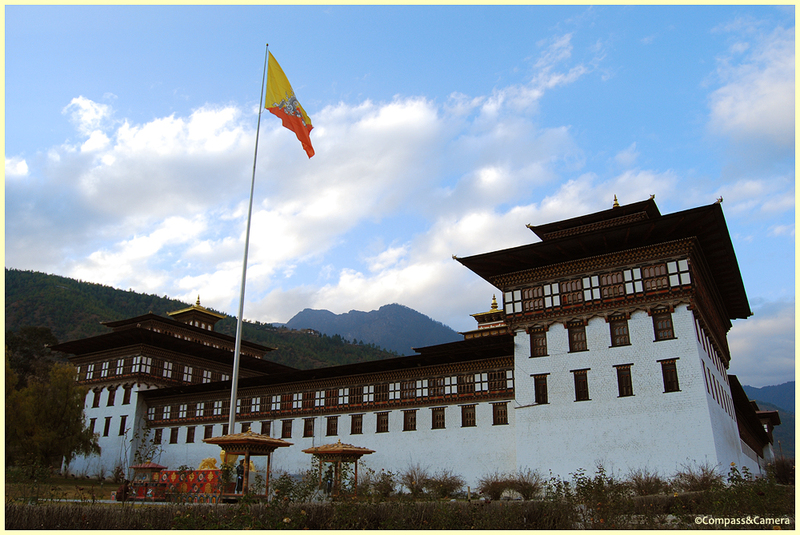 It is great to learn that you had enjoyed traveling Bhutan, its landscape, culture, and people. Yes, it is one of the safe and protected country. Life is still very traditional which I like very much. Fortunately or unfortunately, I am struggling at the other side of the world and can’t go there even though it is my birth place. Perhaps, one day, the door will be open for me to get there. It was interesting to go through your blog. Have a wonderful trip there. Thank you so much for your message. I wish for you that your struggle ends soon and you can return to Bhutan when you are ready. You are blessed to come from such a beautiful country. Thanks again! Would you mind capturing and sending me the stunning pictures of lofty southern foothills, too? Will the Bhutan government allow you to travel towards Southern Bhutan? If you can, I would like to have photographs of some of the exotic pictures of Southern Bhutan where Bhutanese people of Nepali origin are likely to been seen observing their festivals, herding their cattle, farming and cultivating rice, maize, wheat, buckwheat, barley, and many other varieties of food-crops and cash-crops in their sloppy and fertile farmlands. I would like to recollect the images and memories of the days when I was there before I had to leave it overnight empty-handed in 1992. Sorry Som, I didn’t get to visit the southern region of Bhutan so I don’t have any photos. Sorry to hear you had to leave so suddenly. I hope you’re doing well wherever you are now. Those are some wicked photos and experiences! Makes me miss Nepal more than ever, and super determined to visit Bhutan now! Wonderful job, will be reading your other posts and looking forward to new ones! Wow, thank you so much! Where did you go in Nepal? That’s easily one of my favorite countries I’ve been to. Bhutan is similar in some ways, very different in others. I’m sure you’ll enjoy it whenever you go. Thanks for reading! Enjoy the weekend. More on Bhutan coming soon! you are able to remove me from that service? Appreciate it! Hmm, I don’t think I have control over that since that’s an option you clicked on. It may be easiest to un-follow me completely and then re-follow me again (please!). Good luck! Thx. Hi Toemailer! Thank you for asking, but I really prefer to keep my content on my own blog if possible. I hope you understand. Thank you for reading! By the way, really nice blog! makes me wanna go back to Bhutan! Wow, what a fun coincidence! She’s a beautiful little girl! Thanks for your comment and good luck with your new blog. I agree — I want to go back to Bhutan, too! 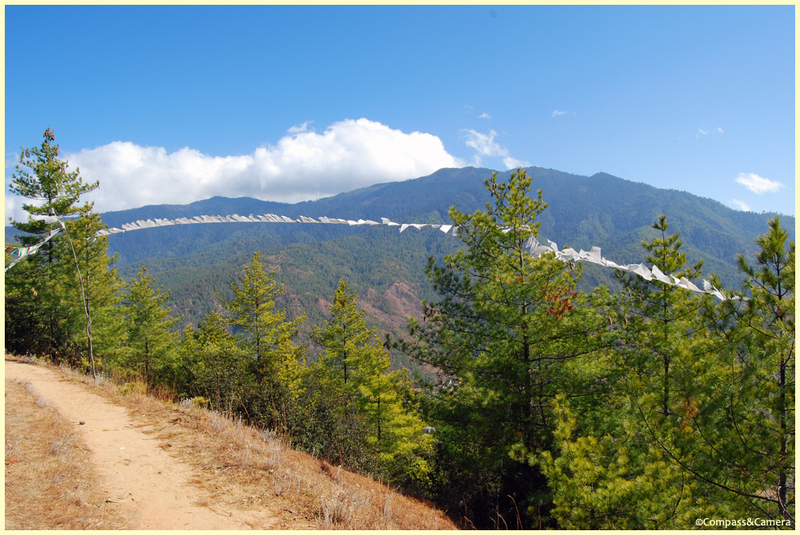 Just came back for a revisit to Bhutan…I’m thinking of going in December. Just realized that the buildings there look like the buildings at the Uof TX, where I went to college, modeled after them, or somewhere like them, perhaps Nepal. Perhaps that architecture stems from one source? The slanted sides. If you’re still thinking about Bhutan, hope you contact Bridge to Bhutan. They are such great guys. Interesting that U of TX has similar architecture? Wonder what the impetus for that was? I knew why UT used that style…can’t remember now. Maybe the architect went to Tibet or Bhutan…something like that. Why else? I keep coming back to your post. I just LOVE your last paragraph. But every time I read, I worry. I worry about what I might write–what is left to write, you did it all. I hope you don’t mind, in my next post I might be inserting another word or two about my “Kellian” scheme for travel again.